Have you ever noticed how after fishing hard for a couple days, that the fishing line on your reels doesn’t cast as smooth as it did when it was fresh? The reason for this is that over time you’re fishing line acquires memory, attracts all kinds of microscopic junk onto its surfaces, and along with the sun, ages the line making it not as manageable or as easy to cast. 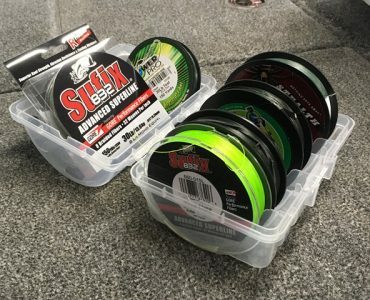 Now, you could just choose to re-spool every few days or weeks, but that starts to get very expensive when you have a rod locker full of reels to fill. It’s even worse on your wallet if you like to use today’s premium fluorocarbon or braided superlines for the majority of your fishing. You may be wondering even, does line and lure conditioner work to solve these problems? 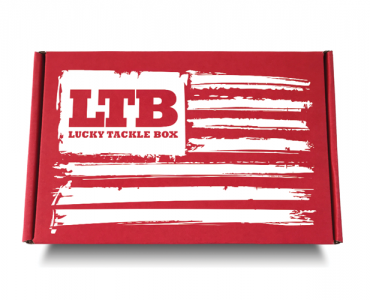 The answer was most likely born in the professional bass fishing tours, where anglers are looking for any advantage they can get to catch more fish. By conditioning fishing line, memory is reduced, and anglers are able to make longer casts, with more precision. However not all line conditioners are equal. Many so called line conditioners are silicone or hydrocarbon based sprays that don’t actually adhere to your line and end up making more mess than it’s worth. In this KVD Line and Lure review, we show you 10 reasons why most serious fisherman consider it to be the best fishing line conditioner for fluorocarbon, braid, and mono lines. The fact that KVD Line Conditioner is not messy or greasy is a big deal to me. It comes in 4 ounce bottles with a plastic pump nozzle. The push button nozzle makes it very easy to accurately apply a coating of the conditioner to your spool of line and nothing else. Any small overspray onto your reel can be wiped off with a soft towel. You can spray this onto a clean microfiber cloth and run new line through it as it goes onto your spool, treating all of your line from the start. Then I give each reel 3-4 sprays each night before I go fishing so that I have soft and castable line from the first cast. There are no oils, silicone, or solvents in the KVD spray conditioner, so there is nothing greasy to get onto your hands or inside your reel components. 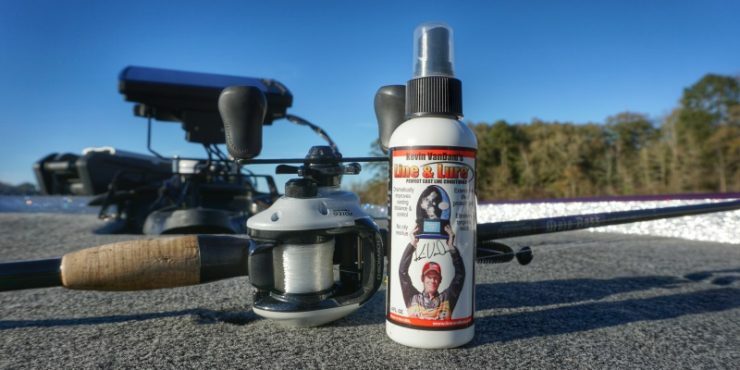 Other line conditioner alternatives only stay on your line temporarily, and are soon flung off when you cast, sending slippery, greasy lube on your clothes, ands and reels. This line conditioner is made of a special blend of polymers that adhere to the surface of your line, giving it a silky feel. This silky feel is the line becoming softer and suppler. The polymer blend is also hydrophobic, meaning it repels moisture. By repelling water from your spool, you have less friction and resistance during the cast, improving your distance. The softer line makes it easier to make accurate casts. After applying the fishing line conditioner to a spool and letting it dry, you will notice that there appears to be less memory in the line. This is once again the polymer formulation adhering to your line, smoothing its surface. With less memory, a natural byproduct is a reduction in line twist. Line twist is a bigger problem on spinning reels, and if I can reduce it by using a line conditioner, I will. Backlashes happen on baitcasters when you cast too hard and your spool overruns your cast. It also can happen if you get a small kink in your line, causing a blow up inside your spool. Because your line becomes smoother after using the spray, you can dial back your cast strength a bit, lessening the risk of backlashing. On the same note, softer line is less prone to kink and cause backlashes. I personally love using KVD Line Conditioner for fluorocarbon. Fluorocarbon line is stiff to begin with, which is one reason why fisherman are hesitant to make the switch. I started using Seaguar Red Label line and really liked the performance. The only issue I had was the stiffness, and it seemed to get worse after a few weeks of use. Now I use line conditioner on fluorocarbon and it has enhanced the overall performance. A few sprays refreshes the feel and I’m able to keep the line on my reel longer. Don’t be afraid to try KVD Line and Lure on your braided line either. The polymer coating has the same effect on superlines as it does mono and fluorocarbon. 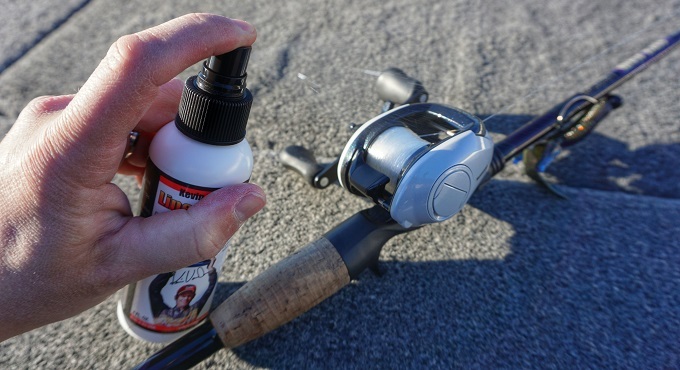 Braid tends to have a distinct “whine” noise when casting and reeling, and the conditioner helps soften those sounds. The coating also helps keep debris and junk from fouling up the braid fibers. I only recently learned that Line and Lure is also an effective screen and lens cleaner and protectant. Treating your fish finder screens with KVD Line Conditioner helps keep water spots from forming, and helps maintain sun glare reduction. The same goes for fishing sunglasses. I like to spray some onto a cloth and clean my sunglass lenses to keep the optics sharp. Using that same microfiber cloth I use on my screens, I will buff it onto metal lures like spoons and spinnerbait blades to give them a fresh shine. 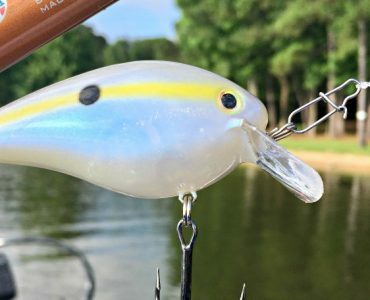 It can even be applied to chrome colored crankbaits like a rattletrap. So far we’ve focused mostly on the “line” part of Lure and Line. It is a commonly overlooked benefit, that applying KVD Lure Conditioner onto your lure components can help fight rust from forming. 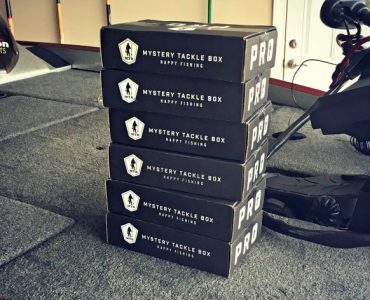 There is nothing more frustrating to me than opening my crankbait box after the winter only to find a bunch of rusty treble hooks that need to be swapped out. Fishing pliers are notorious for getting rusty hinges, and hitting them with KVD from time to time can help prevent that. So there it is, all laid out on the deck for you, the 10 reasons why I never leave home without a bottle of KVD line juice in my boat. If you fish a lot, use fluorocarbon or braid, and want to get the best performance out of your line, then I recommend trying out a bottle.